I'm going to share a little story with you. It will show you just how passionate I am about cloth diapering, and maybe show you I'm a little crazy too! I attended BlogHer this year. My little Capri goes everywhere with me, so it's just natural she would attend with me. She hopped a ride in the Ergo carrier and was the best travel buddy anyone could hope for! In planning for what to pack, many suggested I just forgo the cloth and use disposables for the trip. It would be so much easier, right? I'll agree to the easy part, but I am a cloth diaper Mama and not only would it have felt bad, I write about and promote cloth diapering at my blog, so in attending a blogging event, I would feel pretty dishonest to abandon them just for convenience. I packed all my favorite shells and inserts. I packed a LOT of them - most of my stash. You know, what if she gets a bad tummy? Or what if I have no way of washing them and I have to use a fresh start with each change? What if while I'm in San Diego a zombie apocalypse erupts and I have no access to electricity - I prepared for the worst. I stayed at the Hard Rock. I bet their bathrooms have never seen anything like us before! I ended up washing, by hand, each day, all of my inserts. I brought my diaper detergent and did a cold rinse and hot wash followed by a hot rinse. After ringing out as much of the moisture as I could by hand, I allowed them to hang in the shower all day while I was out and about. When in the evening I returned to my room and was ready to shower, I hung them on hangers in the closet over night to air dry the rest of the way. I ended up with plenty, so never needed to use any of the hand washed diapers. I brought my wet bag so I brought all of them home in that. It turned out well - I didn't have to bring home any stinkies and was prepared for any diaper crisis that could have come my way! BUT... and this is a big but. I could have averted all of that. 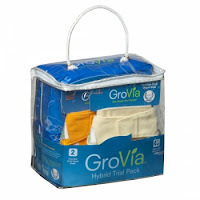 After returning, I received a GroVia Hybrid trial pack to sample. I realized immediately that the hybrid is the cloth mama's answer to disposables and how much easier life would have been if I would have only known. The hybrid is an AI2 system that consists of the shell & biosoaker. 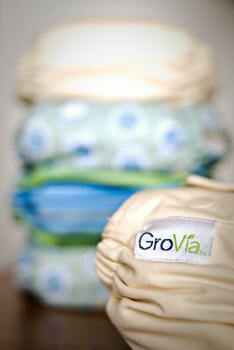 Simply lay/spread your BioSoaker in your GroVia Shell or favorite diaper cover and fasten on baby. Use sticky tabs to adhere to cotton underwear as trainers! The biosoaker is disposable and is Fragrance, Dye, Plastic, & Chlorine Free. Is non-toxic for baby & environment and has been tested for harmful substances according to Oeko-Tex Standard 100. Perfect for cloth diapering on the go - anytime you'll be away from home - even just a day of errands. We took a mini trip after returning from BlogHer and I had the opportunity to put the hybrids to the test. They are genius! You're staying true to cloth and not sacrificing convenience. Comfy & safe for baby and sooo easy for Mom. I hear some people use hybrids for their diapering system. I personally would not. I like the idea of washing and reusing cloth. That way I know exactly what is covering my baby's bottom and I know that I am contributing no diaper waste. But for travel ,busy days, or emergencies these are PERFECT and I will now never be without a stash of GroVia biosoakers. You can purchase GroVia hybrids and traditional AI2's including the new newborn line at many local and online retailers. One super lucky winner will receive a GroVia Hybrid Trial Pack, which includes 50 eco-friendly BioSoaker Pads, 2 GroVia Hook and Loop or Snap Closure Shells in winners choice of color or print & closure. *Follow me @jamaise at Twitter & Tweet this : RT @jamaise #GIVEAWAY #WIN GroVia ~ Cloth Diapers ~ Hybrid Trial Pack #clothdiapers http://bit.ly/rdt6Nj Ends 9/21 tweet each day for one entry each ! I follow via GFC as Carolyn H and I would choose the Cloud & Surf colors in hook & loop. I follow via GFC as Andrea. I would choose the GroVia® Shell Snap Closure in Kiwi and Mandarin! I entered the Dr. Sears Zone Diet giveaway! i follow on google friend connect! I would choose surf and cloud in snaps! I love both the SURF & Blackberry Hook & LOOP. I would choose Surf and Kiwi in Hook/Loop. I follow on GFC and would love the planes and cloud with snaps! I like Grovia on Facebook (Madeline Doms Miller). I follow you on Twitter (@MadelineMiller) and tweeted http://twitter.com/#!/MadelineMiller/status/112207777094569984. I'm a Friend of Wishing Penny via GFC (Katie Stewart). I visited GroVia and I'd love the shells in snap closure in Owls and Vanilla. Thanks! I follow via GFC and I love the Owl Shell with Hook & Loop closure. I would choose Cloud in snap closure for my shells. gfc follower ticklemetiffyyyy and Id love Surf or Cloud in snap closure. I would choose the Nature print and the Cloud color. In hook and loop! I follow and I would choose Nature in hook and loop. Minerella following you and I would like hook/loop in vanilla please! I'm a friend on GFC and would choose snap closure, owls and blackberry. Follow you as Kimbo. My favs would be the snaps in owl & cloud! Sent a fan/friend request to you on FB. Follow you on networked blogs via my FB....Kimberly Bell. I follow via friends connect and I would pick snap closures in Surf and Owls.